What to buy to replace an ailing 2000 Ford Contour that my wife used an average of 3000 miles per year for 10 years? For low cost that Contour will be hard to beat, but the 2nd generation Ford Focus is promissing. She also wants a car that is smaller than her Contour which limits the field of candidates. I hear advice on getting a Corolla or Civic because they last seemingly for ever. But we only need it to last for 30000 miles over 10 years. Not paying for a haloed badge will be the first savings. Besides, Focus reach very hign mileage as well. What about its looks? It is bucking the trend of today's swoopy cars and dorky fascias. It may not be trendsetting but it is inoffensive and looks better with every new warthog leaving the dealer lots and entering the street scene. How about "inner values"? To me a car that feels well built and fits like a glove is preferable over a flashy design. The wife may differ though. 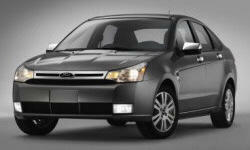 Why the 2010 Ford Focus? The 2nd generation of the North American Ford Focus does surprisingly well in reliabilty rankings. Look at TrueDelta stats and else where. According to the shop I frequent the only weak point is braking rear springs in areas where road salt is used. In addition I found that the motor mounts are prone to failure. The SE has a rather soft suspension, just what I am looking for. If you like it sporty check the SES trim. It's an economy car. But it is a quiet economy car. Sure, you hear the engine and some road noise but everything is nicley muffled. The engine note can be a bit buzzy though. Of the three models I drove the one with the highest mileage was the most quiet. the other two were objectionably noisy and vibrating. in one of the not only was the engine vibrating I could feel it under foot. New motor and transmission mounts will fix that. The smooth riding car must have been fixed. I am ranking the driver's seat high in comfort even though 10 minutes is not enough to be sure. The seat has a lot of adjustability, including height. It feels like sitting on a platform rather than a hammock. The seat felt supportive without being hard. I can imagine it would allow for long distance travel in comfort. The steering feels right. It has old style hydraulic power steering. Recently, I tested cars with electric power steering and they felt strange, like having a mind of their own. I also tested an '08 Focus that did not feel right. I assume the tires were severely under-inflated or the toe-in was off. The subject of this review felt good with nice feedback and no need of constantly correcting in order to go straight. Why Not the 2010 Ford Focus? It's a matter of taste, so take it with a grain of salt: it's a study in rectilinear design. It is a total turn about from Ford's oval theme of the 90's. It's all about functionality pushed into rectilinear shapes. Only the instruments are round. It ends up as utilitarian and sterile. The switchgear I had my hands on felt solid, though. Some will complain about hard plastics everywhere. I don't. Our cars are no pets. We have a dog for that. A matter of taste again. It is not following the trend of swoopyness that abounds everywhere. There is an upside down Nike swoop that serves as a character line on the sides. It is not leading a trend either. Form follows function as long as that form is rectilinear. Some Focus have that superfluous fake fender vent. Standing alone it is not a convincing design. But in a sea of swoopy bodies and/or dorky grilles it becomes very recognizable despite its modesty. There is a clear practical advantage to the boxy styling: it is easy to gauge the outer dimensions of the car, making it easier to maneuver in tight spots. It's tight in the back. Entry and egress are a bit cumbersome in particular for the feet. My shoe size is 9.5. If someone plans on using any Ford for very long time it is advisable to compare spare part prices with those of Toyota/Honda. Ford spare parts appear to be significantly higher. This won't matter much for the intended low miles use in our case. But figure in a set of motor mounts. ...don't matter much. It has a radio, A/C, Power Windows, Power Mirrors and Cruise Control. We don't need My-Synch and other do-dads. My wife may want a tape player. I found there are bezels available on E-bay to accomodate after market radios. Looks very good. But it is not that important if you drive only 3000 miles per year. However, because it is a more comfortable car and a more fuel efficient car than our other vehicle it may get used for long distances now and then (if we actually buy one). I find it commandable that the good fuel figures are achieved with a rather conservative means: no VCT, no GDi, no movable grille vents - just refinemnet of standard proven technology. Appears to be good. They should be superior to the Contour--by far! It seems many small cars could meet our requirements of low cost basic transportaton. The Ford Focus Gen2 promises to do this exceptionally well as it is highly rated for reliability and fuel economy. It is conservatively designed and apperently well built. To me it fit like a glove. I hope for my wife it will as well. See TrueDelta's information for all Sedans, Coupes, Hatchbacks, and Wagons.